After the deer escapade, we (accompanied by Snowwhite and Red Rose) proceeded to our first temple for Day 5 - the Todai-ji temple, a massive structure in wood, ranking as the highest wooden structure in the world - only to be surrounded by some more deers here. The Todai-ji temple is one of the most flocked temples in the town, no wonder then it's also popular hangout place for the deers. The main Nandaimon wooden gate took us to the temple site, at the center of which stood the main temple built entirely out of wood... centuries old and housing one of the largest images of Buddha in Japan (the second largest being the Giant Buddha of Kamakura). The surroundings were peaceful with the lush scenery of Nara park all around and the temple standing right at the center looked beautiful from every angle that I saw. We stood there, right in front of the temple admiring it's grand scale and glory. 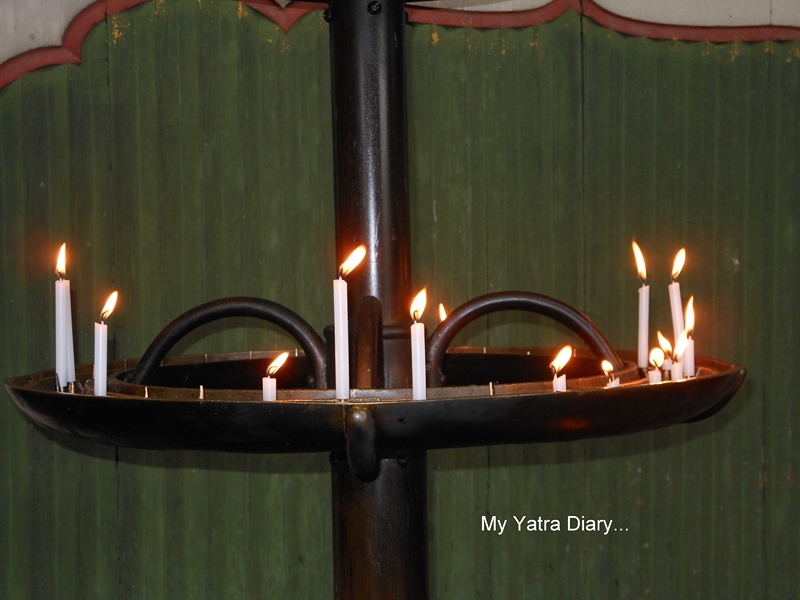 The temple undoubtedly was huge and remarkable, but it was the peace permeated in the quarters that overwhelmed me more. Can you guess what they symbolize? Looks like the tip of a shoe, I said rather sheepishly. Now what could a shoe be doing at the top of a temple? Ha, talk of creative minds! Of course, I was wrong! History has seen fire destroy the edifice twice which is why the authorities decided to build these water symbolic structures on the top of the temple as a protecting force against fire. When we further learnt that this temple today was a mere scaled down version of the original one which was 1.5 times bigger, the grandiosity of the original structure was surely hard to imagine. Four columns of marble flooring led us to the main temple hall, all of them laid in such a manner so as to depict the journey of Buddhism from India to Japan via China and Korea. As we approached the hall, we paused again; this time for taking in a bit of the sacred vapors from the incense bowl. This would protect us from all diseases and keep evils at bay. In the hall, the bronze image of the Great Buddha was striking – big, life-like and bulky. Around the 8th century, Japan had gone through a lot of troubles and difficulties. It was at this time that Emperor Shomu had decided to enshrine the Great Image of Buddha (Daibutsu) to restore the lost peace and happiness of the country. Through centuries, times came to become better but the image continues to do it's work -- infuse life, hope and peace in it’s enthusiasts till date. Snowwhite took time out pointing out the various aspects of the statue in detail. There was a lot to learn about the history of the statue and it's built, how His face was more radiating than the rest of His body and how His webbed hands gave out a blessing for one and all. There was a lot of peace to be found in His gaze, a lot of solace while standing at His feet. His serene face, the lotus flowers around Him, the glow emanating from the candles further enhanced His message of leading a pure life. 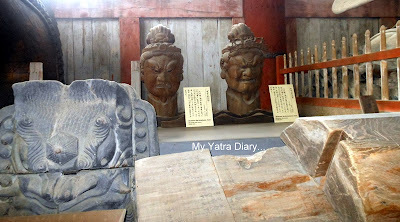 Besides the image, the temple also had a bell to announce your arrival in His house and quite a few Buddhist statues and other historic sculpts preserved over the years. 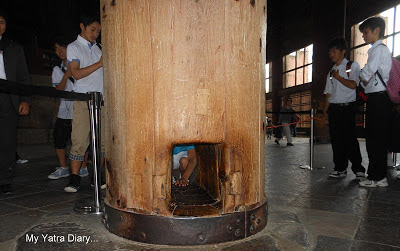 The highlight of the hall, however was a partially hollow wooden pillar believed to be the size of the Daibutsu's nostril. It is said that those who who can pass through attain deliverance in their next life. Why don’t you give it a try, Arti? We think you can make it. After some kind motivations from my blogger friends, I pushed myself through the wooden hole but gave it up soon after, after getting stuck mid way. A bit more prodding from Snowwhite and redrose and I was down, trying again. Just that this time, I was a lot more determined! I twisted my body this way and curled up that way until finally I realized that I had successfully passed through the door. Boy, if I wasn’t delighted! I had a fair enough reason too. 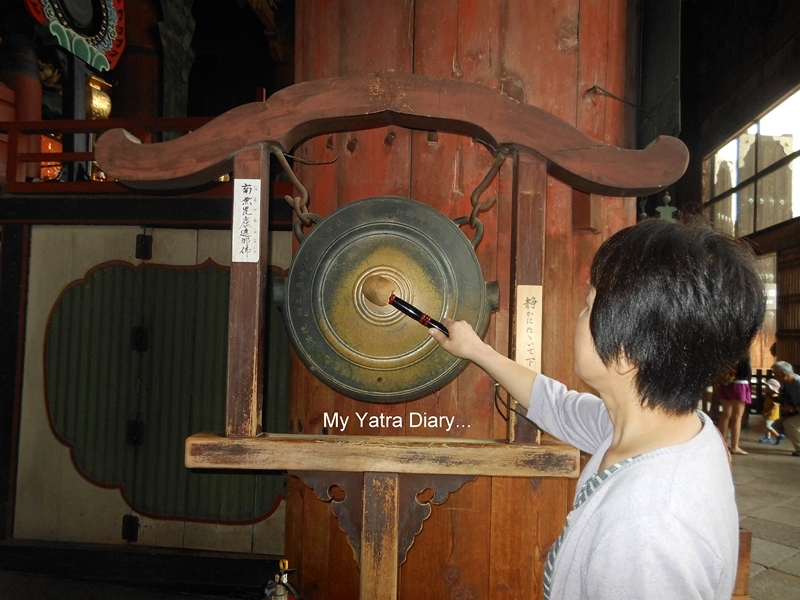 Thanks to my Nara friends, albeit with a little difficulty, I had opened my door to Nirvana! As we circumambulated the temple hall, I heard more and more stories from their folklore and realized that there was a lot of wisdom, a lot of knowledge veiled within the temple corridors... not only historical but the other worldly as well. I realized... that this place had it all - beginnings, belongings and also... the eternal gates to salvation. Before heading further, we made a quick stop at Binzuru Sonja - the healing Buddha; one of the original disciples of Buddha. that corresponds to your ailing part and then place it on yours, your ailment will disappear. We could barely reach out till his legs, but even then we all made sure we did not miss out on touching this one! Fascinating reading, I'm intrigued by the Buddha's nostril. 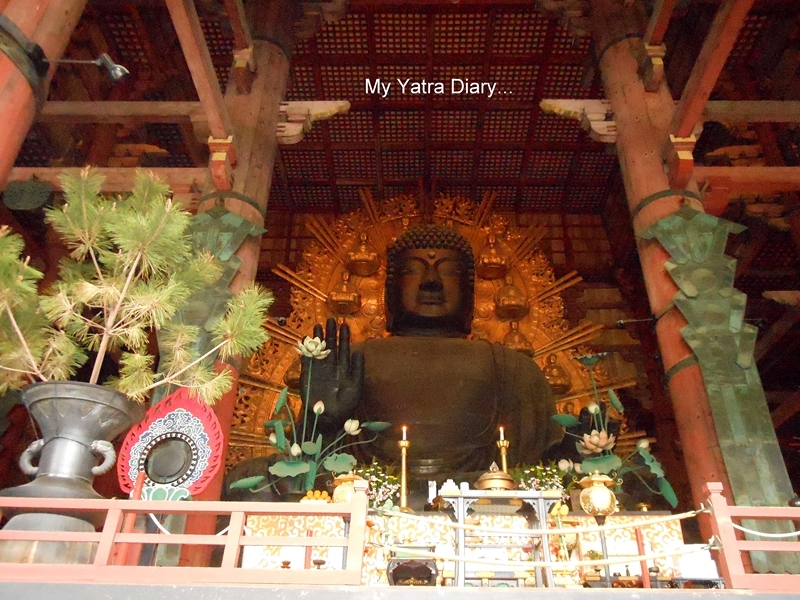 Another wonderful visit to Japan, Arti! Terrific captures and information! I love seeing the deer roaming the area!! Have a great week! what a delightful post! I would very much like to try my turn at crawling through Buddha's Nostril. I'm happy that your door to Nirvana has been opened for you Arti. I really like the brilliant and insightful approach to warding off future fire damage to the temple. happy week to you Arti. Good job, you made it! I would have never even tried, being really claustrophobic!!! This Buddha looks just massive! Buddhist temples are always so peaceful. So many things I like about this post! The sacred vapors and the healing Buddha are my favorites though. Great sights! Enjoyed looking at this. Very informative too. 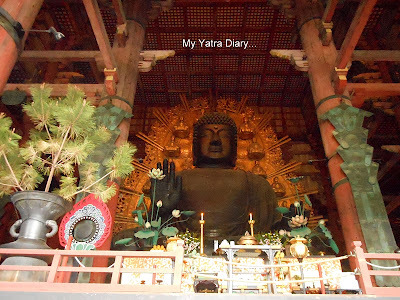 I'm loving your posts about your trip to Japan, Arti. You had gracious tour guides! Your explanations are marvelous. It's been snowing here in Breckenridge. I skied today with my little Grandchildren. This is a lovely place to visit. We are so glad you got through 'Buddha's Nostril' the second time around! :) Our human would not hesitate to worm through it if given a chance! Since I am fat (LOL), I would not have gone through the nostril and would not have approached Nirvana, alas. What an interesting post! Nice read. The temple looks so beautiful. How lovely for you to meet Snowwhite and get shown around! That is a magnificent temple. I spent two weeks in Japan over 10 years ago - I'd like to come back and have a better look around. Oh cool, I'm so glad you explained what the top meant. I was wondering that as soon as I saw the first picture! This is such a beautiful place and I wish I can have a trip to Japan. BTW, you need a lot of determination to go into the wooden hole, I feel sacred going into the Jawala ji cave which is fairly large to hold 4-5 people at a time. Hi. It's a nice trip for you isn't it? You are very lucky. Snowwhite knows anything very well. I enjoyed your photos very much too. 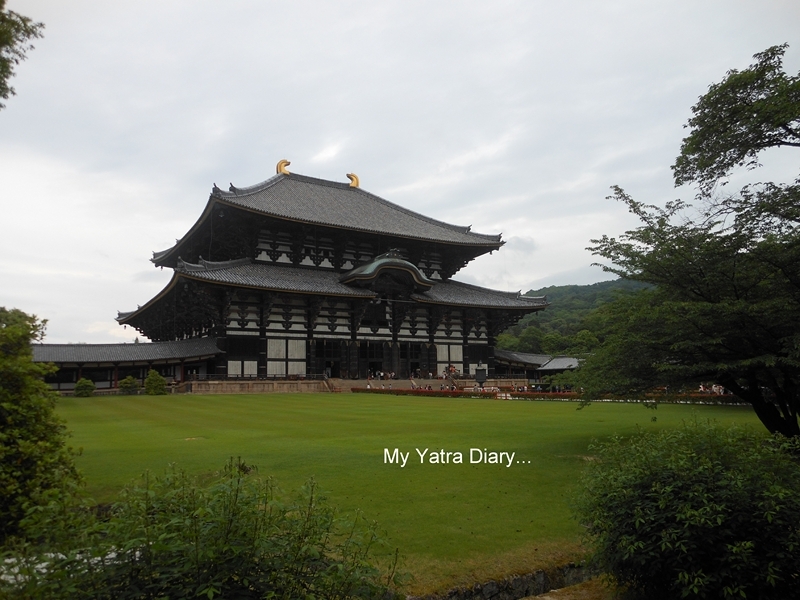 Hey I just came across your blog..I live in Osaka..and I went to Nara few months back.I hope u liked Japan!! Seeing each and every one of your photos now, I am recalling every moment I spent with you. Approaching the main hall of Todaiji, I remember four of us carefully walked on the marble pathway step by step, thinking of the long journey of Buddhism from India to Japan. I was deeply moved by walking on the pathway with you,Arti, from India.A big smile on your face still remains in my mind. Did I tell you when I passed through the wooden hall first? That was when I was a junior high school student as I had a school journey! Of course, I could pass it through very easily. Can you believe it? As you mentioned this big temple with a long history, Todaiji, was established in 743 in order to save the nation suffering from disasters and epidemics. Since then, many traditional events and lectures for people have continually been taking place there. 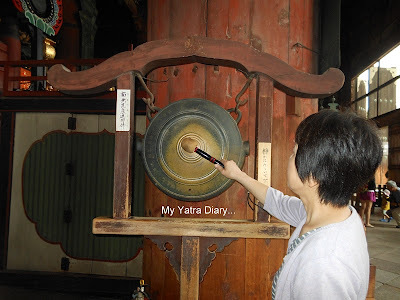 Not only big temples like Todaiji, but also there are many small temples in Nara which have been supported by the local people wishing for happiness and health. On the 18th every month, my family has a monthly ceremony for our ancestors. The priest we know very well from the local temple comes to our house and recite a sutra for about 15 minutes in front of our family Buddhist altar. After reciting a sutra the priest gives us a small lecture of Buddhism.Although I am not one for religion my mother in law who lives with me is a very religious person. Thanks to many local temples and priests in Nara, devout Buddhists are able to have such ceremonies at homes. In Tokyo, where my parents live, people rarely have such ceremonies at homes. Have a good day and see you again! What a wonderful place to visit. Thank you so much for sharing your experience, I especially enjoyed all the photos here. And thanks for visiting and following my blog. :) Much appreciated. I al now your latest follower. @Arti Good morning. Another wonderful post. Thank you so much :) Awesome photographs & post. Wow Arti! The temple looks so pretty. Mostly I love the serene environment that one witnesses in these places. @Lady Fi @Minoru Saitu: Indeed, it was an honour and a great thing of joy to be with snowwhite and red rose. Same is the case with me, as I am doing this series... I am taking delight in all those wonderfully sweet memories I have got with me. I recall our talks on the many similarities between India and Japan while our visit to this temple. I also remember all your affections very fondly and of course, how can I forget your candies! And oh, you passed through the gates long back. I could pass through it only because of both of you or else I had already given up way too soon! A fun visit and obviously a tour you were meant to take, since you passed through the entrance! Hooray. What a lovely time with your fellow bloggers too. Sorry for my wrong spelling. I should have written "the wooden hole first" ...not hall. Deers are so cute that my children want to feed them. Of course, all temples are beautiful and impressive. Nice photos. I need to touch a Buddha and fix my foot. I might go looking for Buddhas her in Calgary. Looks like a beautiful temple. Buddha's statue looks surreal and divine Arti! I liked the way you mentioned the specifics of the statue like face radiating more than rest of the body. And interesting beliefs too.. You know what, I guess our culture is a lot similar to Japanese culture, atleast as far as beliefs are concerned..
An other adventure you have brought me. I can't imagine what the temple must have looked like before the original burned down. Such interesting architecture. 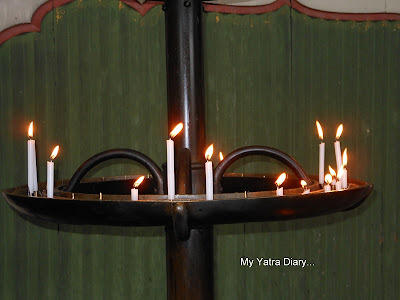 While reading this lovely post, I am recalling a short trip with you. 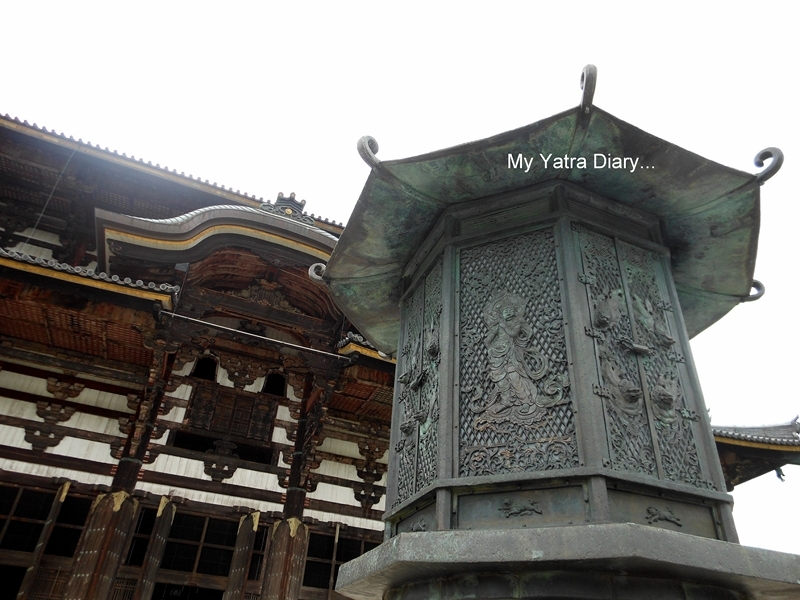 If I could convey my affection toward this temple to you, I would be very happy. Always, I feel everything in Nara such as Nara history, Buddhism, Emperor, struggles , peace and so on has been condensed in this temple and its history. 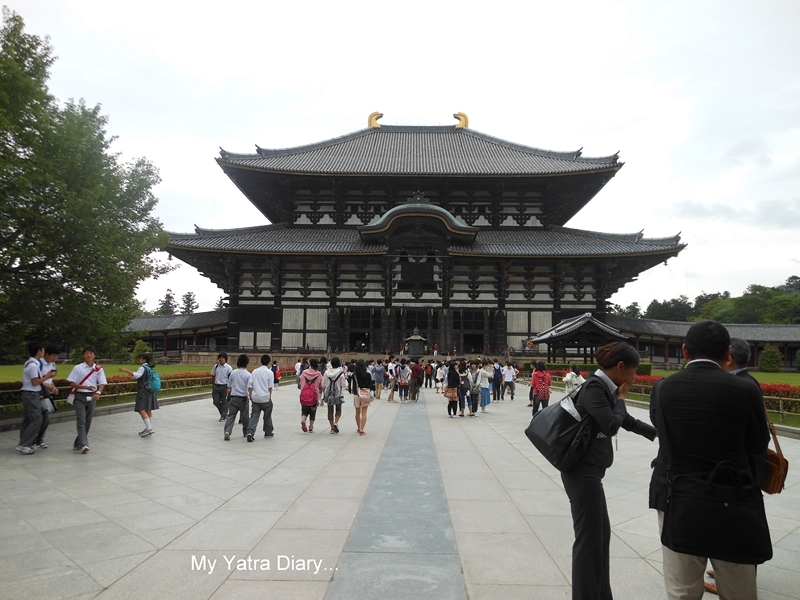 To know Todai-ji Temple is to know Nara. As red rose mentioned, I also was deeply moved, when we walked along the approach paved with four symbolical colored stones. 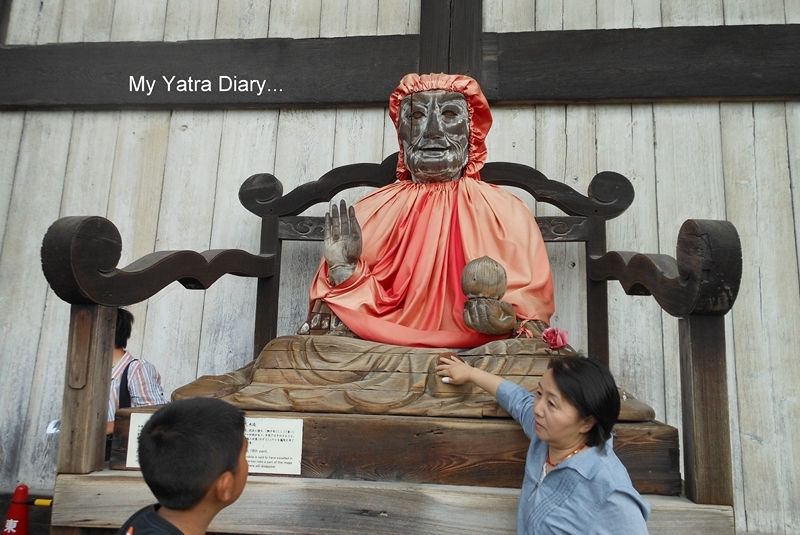 You are from the country where Buddhism was born. 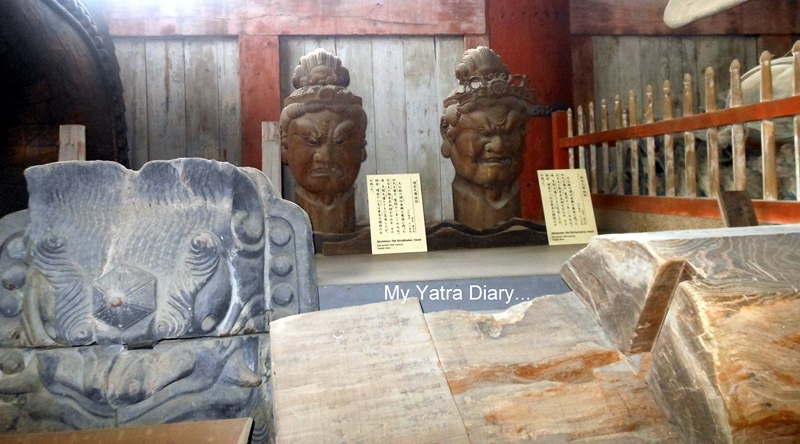 We are in the country which was the terminal of Buddhism. I confess that I haven't go through the hole of the pillar. Do not call me a chicken!! A pair of the ornaments on the top of the roofs of Great Buddha Hall are called "Shibi", meaning fish tail. During colonial times and after, houses here were made of wood. Of course fire was our biggest concern so for example, the kitchens were built a safe distance away from the house. Much later, sand was used to coat the wood to retard fire. It's the one thing that was in the back of my mind as I read your post. I'm glad to see that they now have water on the roof for just that possibility. 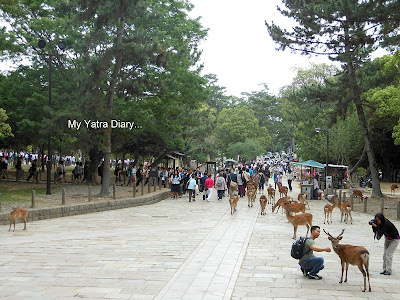 I found it interesting to see so many deer there and also how lush and green the surroundings were. It's so calming, just looking at it. I can only imagine what it feels like being there. Thanks for sharing, Arti! Oh! I loooveee this postt!! Another tour of Japan,loved your post! Beautiful temple. I love the bronze image of Buddha. Nice post. 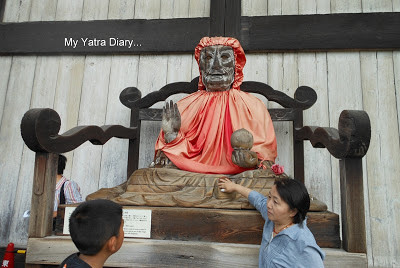 In each post you are narrating about Culture in Japan. That wooden hole looks interesting.